Katja can’t get enough yoga. She gets up at 6:30 to attend the hotel’s offered class at 7. Turns out the teacher only did poses on the right side. A bit unusual, I must say, as it’s normal to train both sides when you’re at it. In the mean time I finish polishing my resume and application for the position at work and send them off. Being incommunicado most of the timezone in Norway on Thursday and Friday because of traveling make me hand them in well before deadline. That done it’s another delicious breakfast. Yesterday we got down early and had the place to ourselves. Going at eight thirty is like wading though kindergarteners. Kids everywhere. But the food is still good, the coffee great and the company best. We hang out by the pool to top up the colors before going home. It’s about thirty degrees and partly clouded. The shades from the clouds are highly appreciated. We eat lunch at the hotel before going out. Katja need to shop more before we leave. We sent stuff back two days ago to manage the weight limit on the plane, so let’s go shopping! We haven’t been long at the mall before we decide to go to the movies. It’s a classy movie with reclining chairs, blankets and serving. Mission impossible 4 is showing and we both loved it. Tom Cruise may be a wacko, but he’s a good action actor. By use if Tripadvisor we locate a small but very good steak restaurant. “Bloody good beefs”, as a good NorwEnglish would say it. 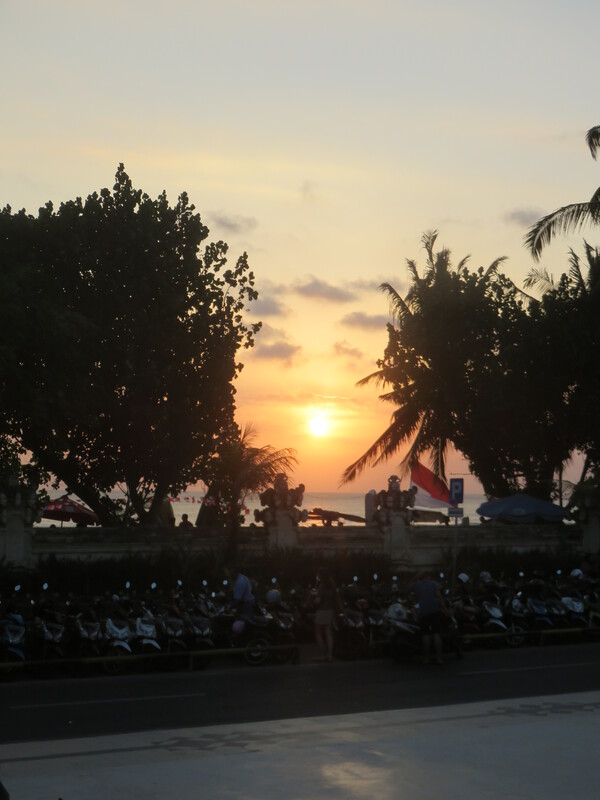 We walk a little in the back streets of Kuta and hail down a cab to take us home. We drive by the laundry and do the last pickup before going to the room. Inside we get these last posts out on the blog and sort through clothes to see what makes it back to Norway and what doesn’t. Last night in a hotel room it’s here. A night on the airplane and next stop – HOME!